Located in Quảng Ninh Province, Vietnam, Ha Long Bay, (or Halong Bay)a UNESCO World Heritage Site, is indescribably beautiful. According to legend, these silken limestone-island-dotted waterways came into being when dragons (‘long”) descended (“ha”) from the heavens by command of the gods and spewed jade and precious jewels to thwart the enemy invaders of the newly-formed Vietnam. These gems eventually turned into the limestone karsts and islands that are present today. When our junk sailed away from the others, into quieter waterways, where only a fisherman or two rowed by in their sanpans, I was overcome (finally) by a sense of solitude and peace, and this world in Northeastern Vietnam became one which I did not want to leave. A rock-strewn different type of paradise, Ha Long Bay was immortalized over 500 years ago by Nguyen Tai, a scholar and poet, who called it the ‘rock wonder in the sky’. 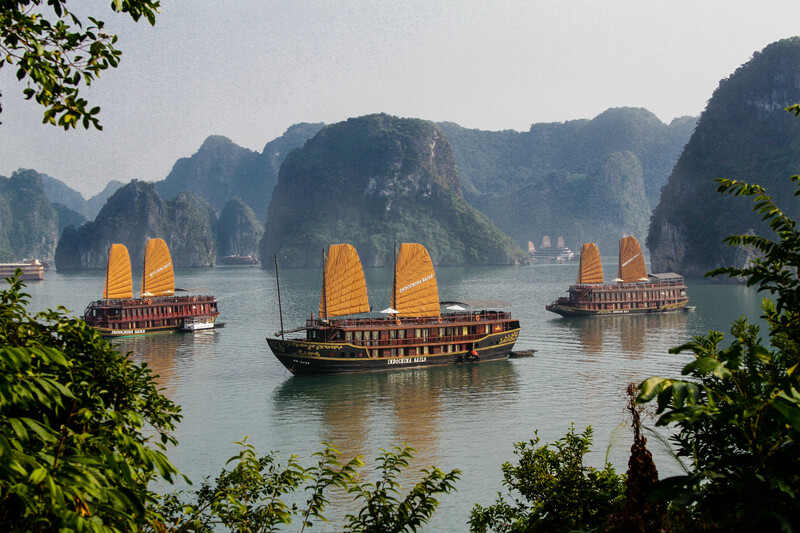 Indeed, those descending dragons so long ago have given us a marvelous wonder and gem in Ha Long Bay. And I am forever grateful to them. This entry was posted in Travel Photos, Vietnam 2011 and tagged "Rock Wonder in the Sky", conical hat, Golden Hour, Ha Long Bay, Halong Bay, island, islands, karst, limestone, Nguyen Tai, North China Sea, sunset, travel, travel photography, UNESCO World Heritage Site, Vietnam. Bookmark the permalink.